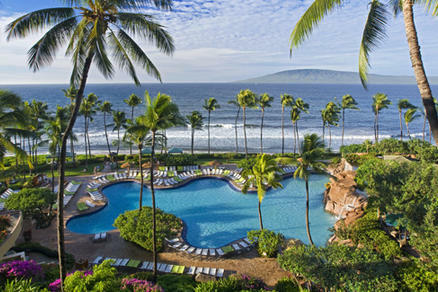 Hyatt Regency Maui Resort & Spa, Hawaii 5.0 out of 5 based on ratings. 1 user reviews. Hyatt Maui is 5 star luxury: they offer a 16-inch computerized telescope and giant binoculars for studying the stars; a 750,000-gallon pool with a 150-foot tube-shaped water slide; a sand-entry children's activity pool; a garden-grotto spa adjacent to two little waterfalls; 15 smart shops, including one devoted to traditional Hawaiian quilts, in a skylighted and wood-lined pedestrian mall; an extensive collection of Asian art and artifacts spread throughout the buildings and the manicured grounds; Hyatt Regency's signature garden-atrium in one of the resort's three towers; the resort's own 55-foot catamaran for snorkeling and sailing excursions; a luau and Polynesian music-and-dance show; a full-service health-and-beauty spa; a zillion activities to choose from; and famed Kaanapali Beach and the warm, blue Pacific Ocean!